Namibia is well known for its impressive landscapes and ever changing terrain. But it also has another side, and is becoming one of the worlds’ new adventure hotspots. Access the areas that 4×4’s can’t reach by hopping on a quad bike. Get in amongst the coastal dunes of Swakopmund. 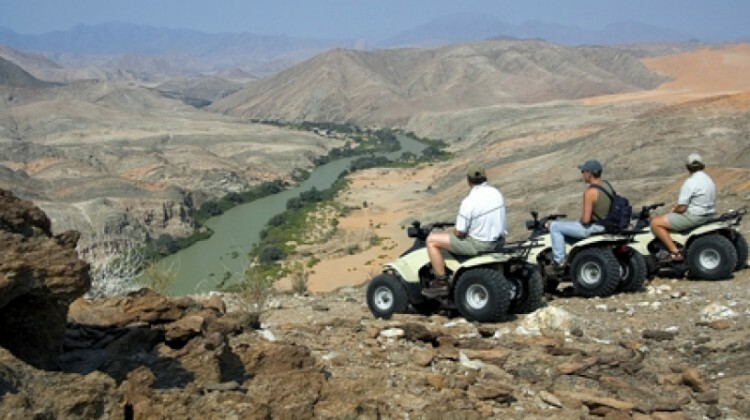 Or quad bike further into Namibia’s interior in the NamibRand Nature Reserve at Sossusvlei Desert Lodge. Or at Serra Cafema on the Kunene River, where you can explore the desert on already established trails. Get ready for the winter sports season with a bit of sneaky practice on down the 80m Swakopmund’s dunes and try your hand sand boarding. If you are after more speed give dune boarding a go; lie on a piece of hardwood and whizz down the dunes at speeds of up to 40mph. Experience the scale and striking beauty of the Namib Desert and the magnificent Sossusvlei dunes from the basket of a hot air balloon. Drift over the silent desert landscape watching the sun rise behind the stunning terracotta-coloured dunes. Walvis Bay is home to several seal colonies and you can get in amongst them whilst you paddle. Aardvark’s Richard and Victoria enjoyed this a couple of years ago, with the seals leaping out of the water and over the bows of their boats. Witness the beauty of Namibia from the air on a short scenic flight from Swakopmund or Sossusvlei. Or take an unforgettable three night/four day trip up the dramatic Skeleton Coast on a Schoeman’s flying safari. Enjoy breathtaking scenery in the Naukluft Mountains and Namib Desert on a riding excursion from Desert Homestead. Endless sandy plains provide easy going riding for all abilities. Take an early morning or sundowner ride. Or spend up to three nights on a riding sleep out and explore deeper into the ancient desert landscape. Visit the home of the Africat Foundation at Okonjima. Witness their long-term conservation plan committed to help rescue and relocate injured cheetahs and leopards. You can track leopards and cheetah using the latest in telemetry technology as well as tracking cheetah on foot. Track rhino on foot at Desert Rhino Camp in the picturesque Damaraland region. Explore this wild and remote area in the company of dedicated conservationists and local trackers. Track desert-adapted elephants, lion, leopard and hyena as well as black rhino. If you’ve got this far and not found an answer to a question you have, please ask in the comments section below, or pop us an email. Equally, if you’d like to see a detailed itinerary in Namibia, or discuss other safari lodges and camps in Namibia please get in touch. It doesn’t matter what stage of planning you are at, simply send us an email or give us a call.